This past week, the story of frustration in a Cleveland “wait line” has been favorably received by Sundance audiences. 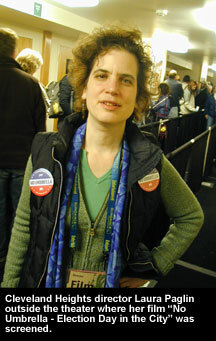 After a Tuesday screening of her 26-minute documentary short “No Umbrella - Election Day in the City,” director Laura Paglin was asked questions about her depiction of the chaos at a Hough neighborhood polling place in November of 2004. Cleveland councilwoman Fannie Lewis seems to be emerging here as a cult hero among Festival goers. The audience on Tuesday alternately applauded and cheered as Lewis was shown working two cell phones and taking city and elections officials to task for the lack of voting machines in the building. Paglin’s film is one of a number of Sundance documentaries - both short and feature-length - based on compelling characters this year. While Hollywood continues to mine old TV shows and comic books for story material, maybe at least some of tomorrow’s heroes will be real people. On a rainy November morning in 2004, Cleveland Heights filmmaker Laura Paglin grabbed her digital video camera and headed to a polling place in Cleveland’s Hough neighborhood to document the events of what would prove to be a momentous day, due to too few voting machines. After capturing some of the chaos, Paglin spotted Councilwoman Fannie Lewis walking across the parking lot, wearing a yellow plastic rain poncho. The filmmaker gave the feisty octogenarian a wireless microphone and kept her camera rolling. ideastream’s David C. Barnett asked Laura Paglin how she decided to do the film in the first place.